Experts and health officials have revealed that florescent lighting could be the cause of more than just an eyesore. There are actually negative health side effects associated with what is called “blue light” according to Andrew D. Hershey, M.D., Ph.D. Longer exposure to fluorescent lighting increases the irritation that can lead to fluorescent light headaches and eventually migraines. People have complained about the glare of fluorescent lighting, and fluorescent light headaches, in offices and schools for years. Teachers have tried everything from softening the light with craft paper, to cloth lenses. Why? What is it about the light emitted from fluorescents that make them such a nuisance? And why have we continued to rely on them? Fluorescent bulbs give off two kinds of UV radiation, UVA and UVB. UVB rays are given off by the sun. They’re responsible for sunburns and skin cancer affecting the epidermis. UVA penetrates the dermis layer, deeper into the skin which results in long term complications like photo aging from prolonged exposer as well as early cataract formation and immune system damage. According to studies, fluorescent lighting actually gives off more UVB radiation than the sun(10-30 times more), thus increasing complications in people with sensitive skin. Lupus flareups, migraines and other fluorescent light headaches, difficulty concentrating, and sleeping disorders are just a few of the health side effects caused by prolonged exposer to artificial lighting sources. Why Not Get Rid of All Fluorescent Lights? Natural lighting is the best alternative to any type of artificial lighting, especially fluorescents. So why haven’t we gotten rid of them all? Fluorescent light remains the most economical and environmentally friendly lighting source on the market, with the most efficient output per square foot. They use less energy and put out more light than heat. When diffused with louvers, eggrates, flat sheets and wrap lenses, they put out an even distribution of light. But even diffusing the light doesn’t always prevent the UV radiation from getting through. 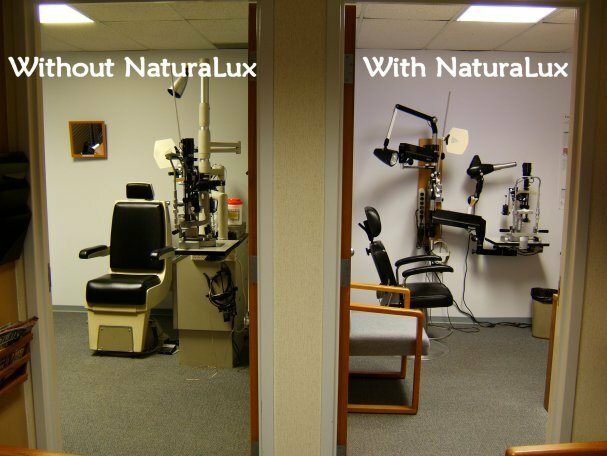 Naturalux lenses are designed to help reduce the glare of the light, adjust the color temperature and enhance the color rendering of fluorescent lighting. They simply slide over the fixture and make all of the difference in the room. Check out the difference in the clarity of these two rooms.. The NaturaLux room gives off an astoundingly more comfortable and evenly distributed light. Now imagine if you were to close the door and sit beneath one of these two lights for a couple of hours? Which room would be the more comfortable? You can order these light lenses online right here at DiffuserSpecialist.com or browse around the NaturaLux website to see if they are the right lighting solution for your space. Check us out on Pinterest and Facebook for all things lighting how to’s and creative lighting solutions. We’re new to the whole social media thing! Download our free PDF here for more information!